Our “inn” is much more like a hostel and we were surprised when we saw the size of our room! 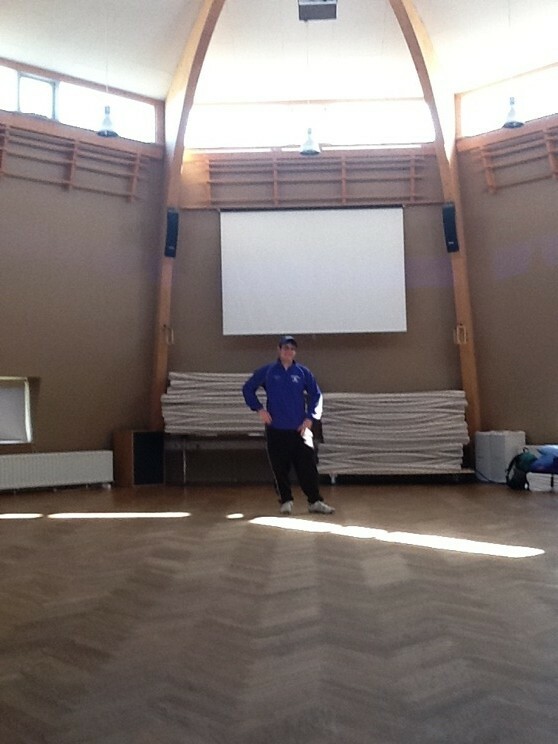 It’s basically an octagonal auditorium with vaulted ceilings. We are lucky enough to have the giant space to ourselves; our hostess told us that usually there are many more guests. We will be practicing our I.S. presentations on our very own projector screen in our “guest room” of sorts. The setting of the inn is gorgeous, right near the small harbor in Hafnarfjordur and with some small basalt outcrops in the front yard to remind us of why we’re here. 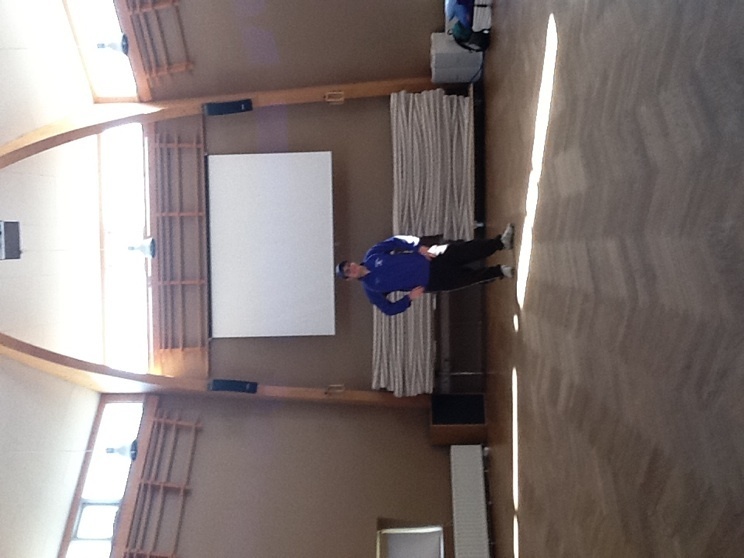 Travis shows the scale of our giant auditorium/room! Tomorrow, we start field work in the pillow quarries. Stay tuned! 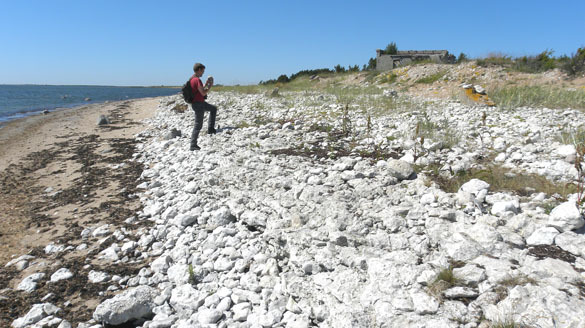 KÄINA, ESTONIA–Today we moved our geological investigations from Saaremaa to the island to the north: Hiiumaa. Our friend Olev Vinn of Tartu University then led us to an abandoned quarry in the Hilliste Formation (Lower Silurian). This made Rachel Matt very happy as it is the place she has been studying as the potential site for her Senior Independent Study project. First, it is not filled with water; second, it is easy to get to; third and most important, it has a diverse mix of fossils and rocks crying out for her attention. She is shown above in front of what looks like an ancient mud mound. The rocks and fossils are so good that the students quickly accumulated a pile of cool specimens. I had to stop them from picking up fossils because we’ve not even started to sort out the stratigraphy. A good sign! Our friend Bill Ausich at Ohio State University will be pleased to hear that there is much crinoid debris, as shown here in this image. It is a calyx plate in the center, with stem fragments around it. Hiiumaa is the island on the Euro to the right of the top star. There is much I can’t identify here, at least not immediately. Another good sign! The only thing that I don’t like is that we’re on yet another island, and this one smaller than the last. 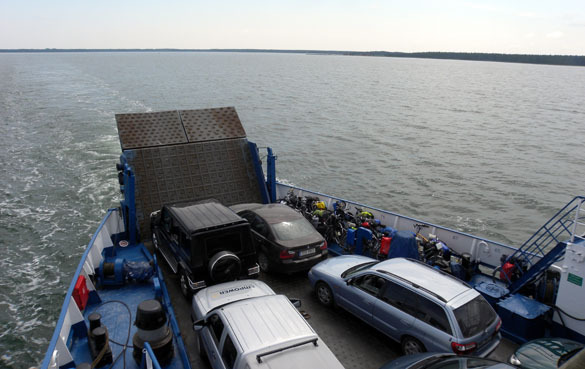 So much water around so little land, and no way off except by these little ferries. Our car is the brown one in the front on the right. I’ll endure for science! 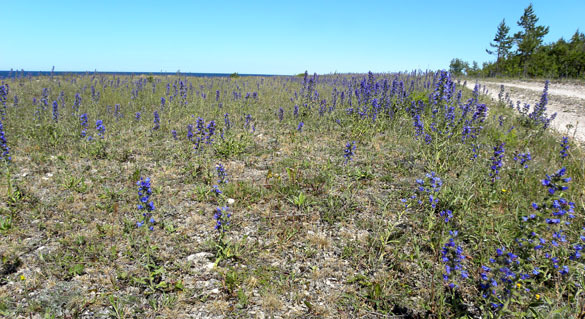 KURESSAARE, ESTONIA–We have gotten to know the western coastline of Saaremaa very well and would like to simply share some of the gorgeous flowers found there. 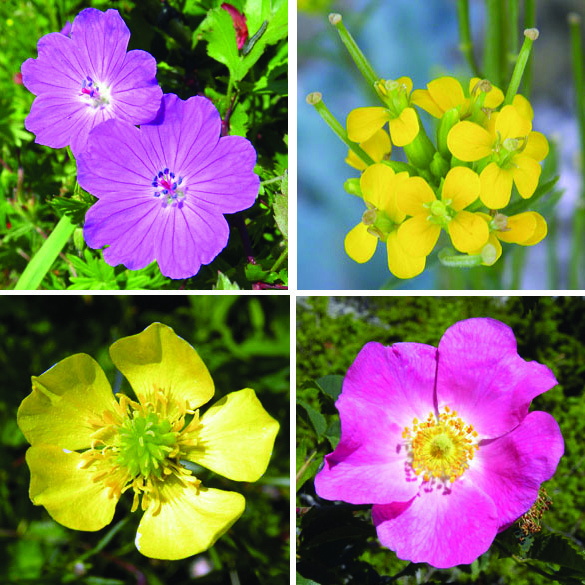 All of these grow in alvars, which are environments on limestone bedrock with thin and nutrient poor soils. They often dry out completely in the summer, so they tend to host endemic species well adapted to these specific conditions and generally out-competed elsewhere. I don’t have any identifications for these flowers. They are here for their beauty and as a break from all the rocks! Like a lonely little onion in a petunia patch, a boulder of red granite sits on the cobblestone beach off Soeginina Cliff, western Saaremaa, Estonia. 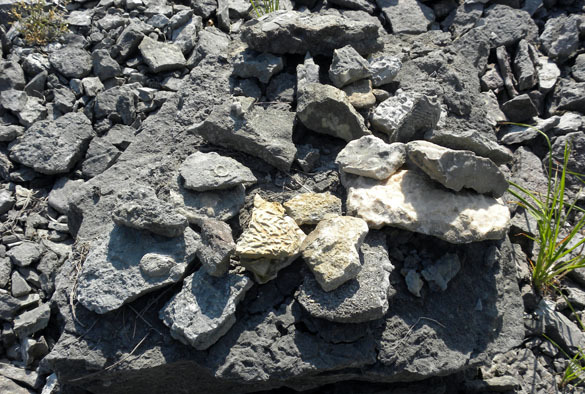 KURESSAARE, ESTONIA–Hard-rock geologists sometimes complain that I flood this blog with too many sedimentary rocks and fossils (and just wait until I get to the Estonian wildflowers!). 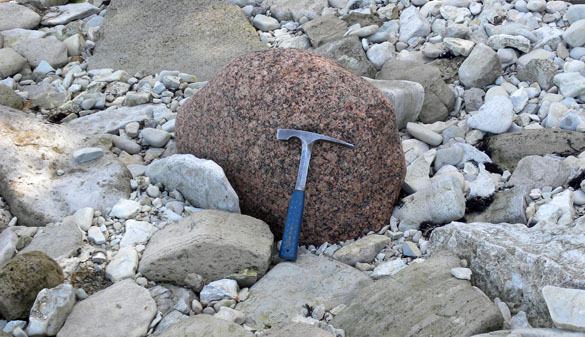 There are actually quite a few igneous and metamorphic rocks on Estonia — just like there are in Ohio — in the Pleistocene glacial till. They show up well on the beaches here in contrast to the sedimentary rocks around them. A closer view of the above rock, just to show it really is granite. Granite in action! 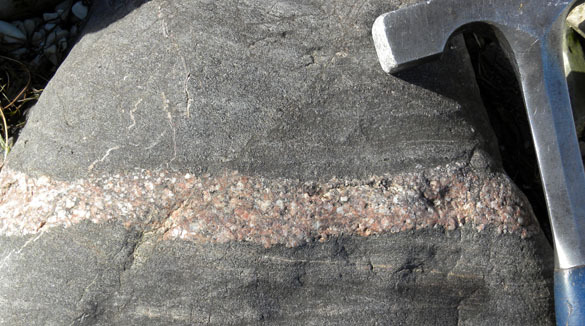 A granitic vein through some unfortunate rock. KURESSAARE, ESTONIA–Our fieldwork today at the Soeginina Cliff locality ended with an examination of a sequence of stromatolites near the top of the exposed Ludlow section. Stromatolites are layers of sediment accumulated by photosynthetic cyanobacteria. 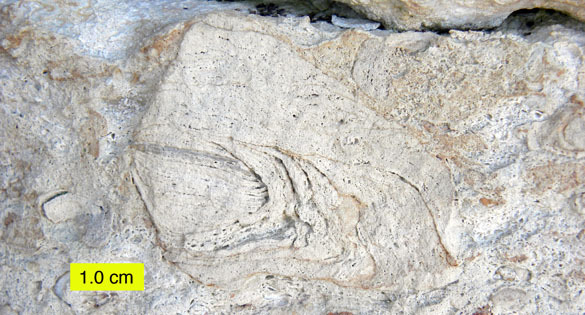 They are the earliest fossils known, some 3.5 billion years old, and these structures are still being formed today. Bacteria were present at the beginning and no doubt will be the only surviving life at the end. 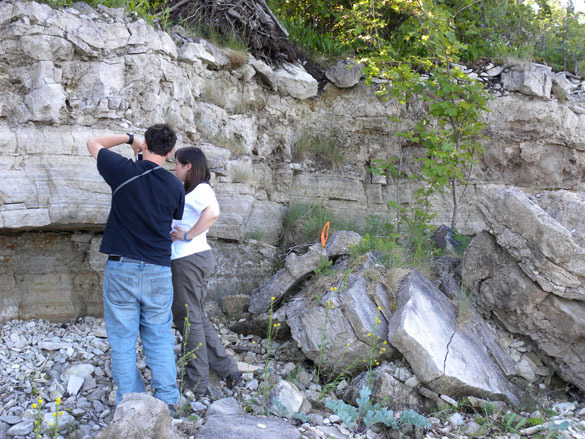 In the image above, the stromatolitic portion of the outcrop begins at Nick’s upraised arm and goes almost to the top of the exposure. It is a complicated story because they seem to be sitting on an erosional surface cut into the dolomite underneath. There are also patches of what appears to be gravel under some of the stromatolite domes. A dolomitic sand fills the spaces between the stromatolite heads. 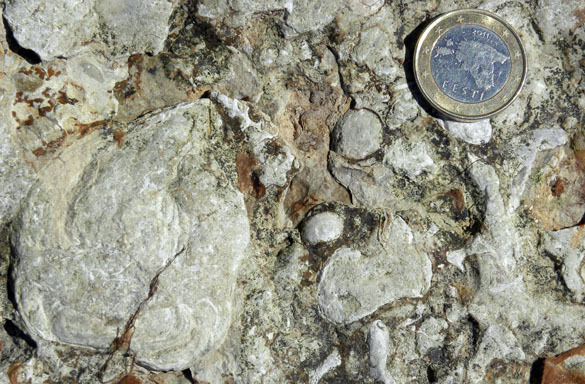 Stromatolites can tell us a lot about the paleoenvironment of this area during the Silurian. Closer view of the stromatolites at Soeginina Cliff. I don’t usually come across stromatolites in my work. The last time I saw a few was with Matthew James on a great field trip to British Columbia. Part of the joy of supervising student research is that I must learn alongside them! KURESSAARE, ESTONIA–A very common perennial plant at the foot of the cliffs we are studying in Estonia is Sea Kale (Crambe maritima Linnaeus). 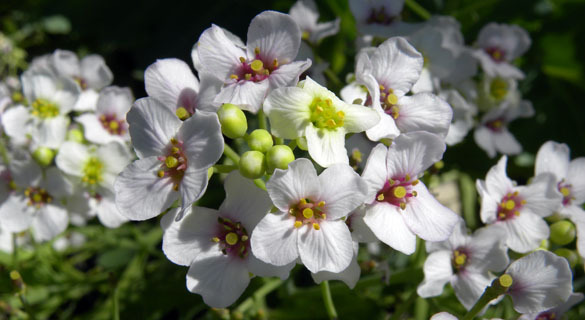 It is beautiful with large, thick leaves and central stalks with bursts of white flowers, each with a purplish throat and yellow pistil. 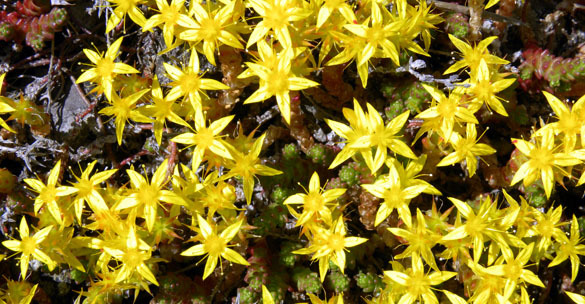 Turns out there is a bit of geological context and history of this edible plant in Western Europe. 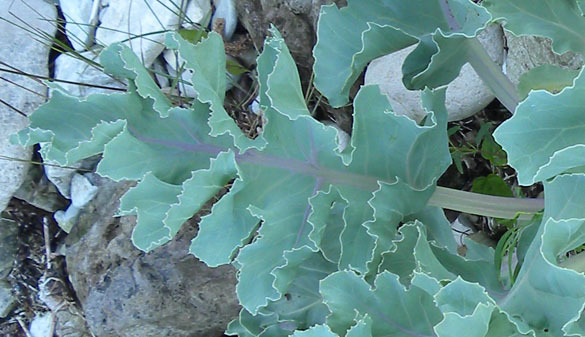 Sea kale lives in a place where few other plants can survive. Shingle and cobblestone beaches have very little soil and are usually saturated at depth with brackish water from rain mixed with seawater. If the cobbles are mostly calcareous, as they are on Saaremaa, nutrient levels are low. Sea kale does well in this place because it is halophytic (tolerant of higher salinity than most terrestrial plants) and can collect enough nutrients because it has so few competitors. Its seeds float and so the plant can disperse via coastal sea currents. It is pollinated by numerous species of flies, beetles and bees, so it has no dependence on a particular pollen vector. Sea kale was a popular vegetable in Europe during the 19th Century and before, but it fell out of favor as more easily cultivated plants became marketable. 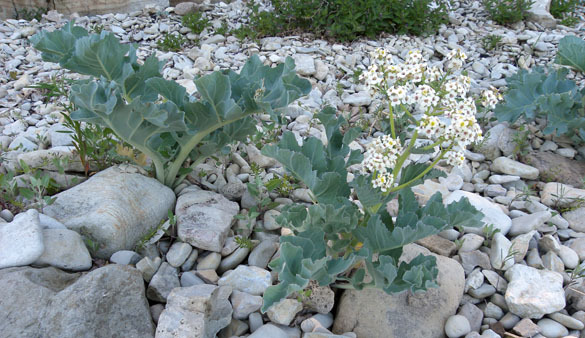 The new geological angle on sea kale is its ability to grow nutritious tissues in salty water. 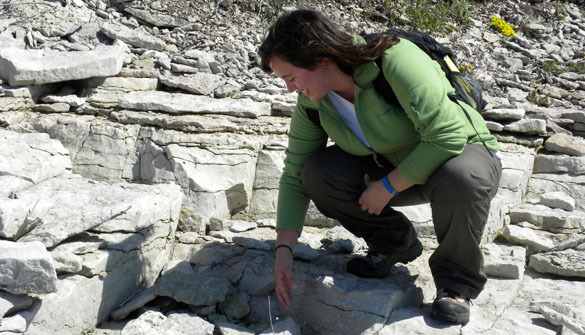 As freshwater resources become more scarce, biologists are looking at more ways to cultivate sea kale in marginal marine environments, and geologists are helping identify and preserve limestone shingle and cobble beaches for its continued growth. One of those places is Vilsandi National Park in western Saaremaa where we’ve been working this week. 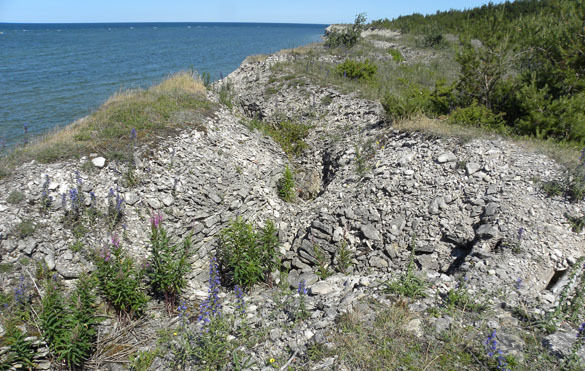 KURESSAARE, ESTONIA–Nick Fedorchuk began his fieldwork today at the Soeginina Cliff site we visited two days ago. The first thing we did was scout out the best place to measure the most complete section possible, and then we started the slow process of sampling and describing the rocks and fossils. On average we did about a meter an hour. 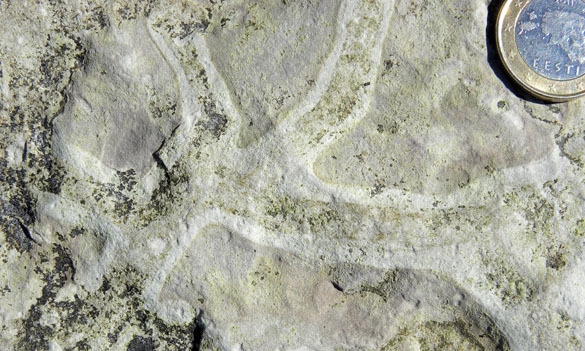 The above image shows one of the curious oncoids in the Soeginina limestones. Oncoids are usually almost spherical because they rolled around as bacteria formed layers around a nucleus. The oncoids in the lowermost Ludlow (Paadla Stage) here show an initial formation as spheroids and then they sat still on the seafloor and grew upwards to make little layered caps. The oncoid was knocked over occasionally and a new cap grew on top of the sideways oncoid. This finally made oncoids with multiple growth directions visible in cross-section. Above is a bedding plane view of an oncoid-rich layer with shelly fossils. Some of the oncoids have formed around gastropod shells. 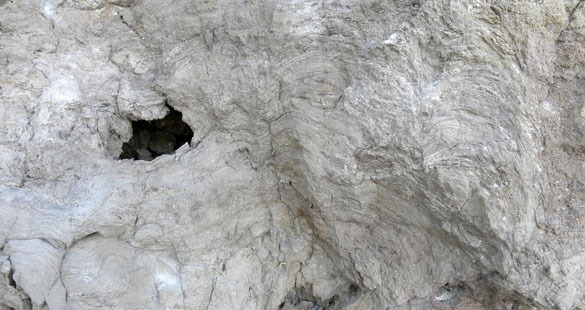 The trace fossils (evidence of organism behavior) are especially interesting because we can see them in bedding plane view (as above) and also in cross-sections. We will look at their distribution using various ichnofabric indices. 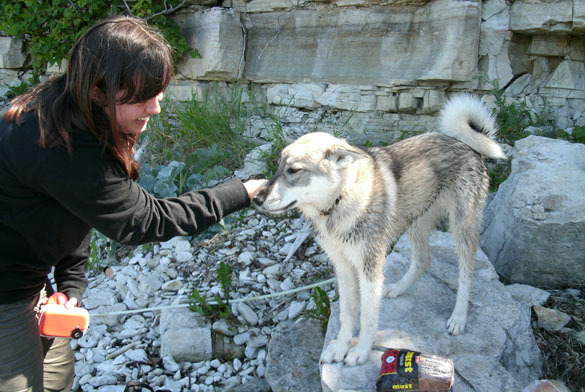 At the start of our day on the outcrop this happy Estonian dog joined the party. It stayed with us the whole time. It liked to splash around in the ocean and then joyfully jump on us — not conducive for taking notes or whacking rock samples, but fun nevertheless. 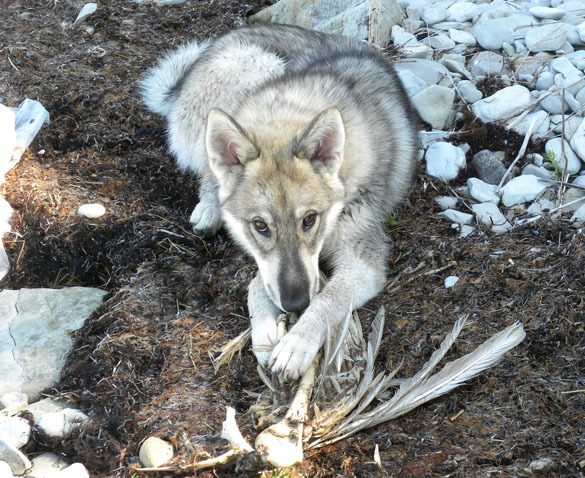 Wolf (maybe the name we gave him was too easy) loves to gnaw on the carcasses of large, long-dead seabirds, bringing them to us as we worked. 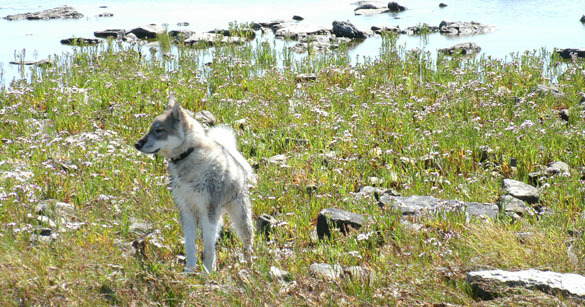 Wolf was sometimes a bit too exuberant, but he was a good friend for the day. 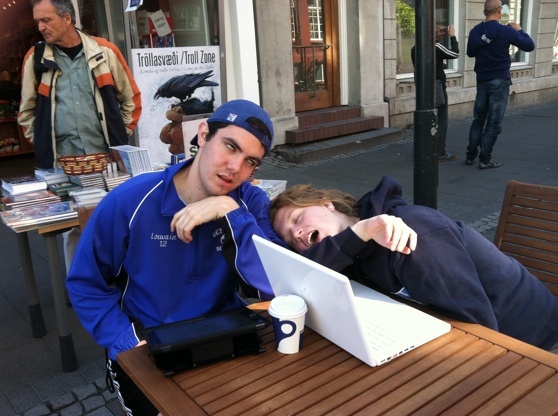 We hope to see him tomorrow at the same place! 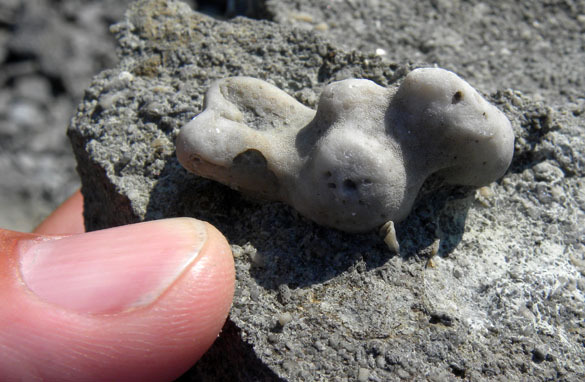 KURESSAARE, ESTONIA–Stromatoporoids are extinct calcareous sponges that were very common in shallow water environments of the Silurian. They are especially abundant in the middle Silurian of the Baltic Region. Today we visited a site called Katri Cliff where a reef composed of stromatoporoids is exposed. Olev Vinn is shown above studying them (with the inevitable remains of a Soviet coastal border guard post in the background). Stromatoporoids made hard, dense skeletons of calcite, sequentially adding layers to them like onions. At Katri Cliff we found many examples of these sponges with rugose corals and tabulate corals embedded inside them. Apparently the sponge grew up around the coral skeletons, immuring them alive. The interesting question is whether the sponges and the corals had a mutual beneficial relationship or if they were actually competing for resources like space and food. Stromatoporoid showing conical rugose corals in its skeleton. 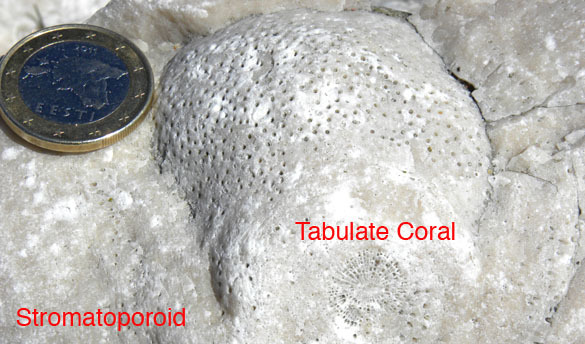 Stromatoporoid broken in half and revealing an embedded tabulate coral. We have placed this ancient reef on the list of possible projects for Rachel, but we won’t know what she is going to pursue until we visit the nearby island of Hiiumaa at the end of the week. And in case you’re tired of so many fossils and seascapes in this blog, here’s another bit of history we saw today: Below are trenches built at the top of Ninase Cliff. The tragedy of 20th Century Estonian history is that we can’t immediately tell who dug these trenches. Was it Imperial Russians in 1917 defending against the invasion of Imperial Germans? Could they have been built by Soviets against the invading Nazis in 1941? Or maybe Nazis in 1944 fighting the re-invading Soviets? There is some satisfaction on this part of the coast to observe that the sea is slowly eroding these trenches back into the ancient limestone gravel from which they briefly appeared. KURESSAARE, ESTONIA–It is always a joy to begin the fieldwork for an Independent Study project — or at least know what the fieldwork will be. This morning we visited the Soeginina Cliff locality on the Atla Peninsula of western Saaremaa and it was all we hoped it would be. 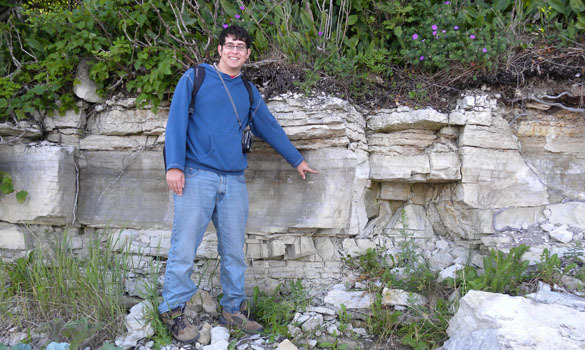 Nick Fedorchuk (pictured above as a happy man with his outcrop) studied the literature about this locality during his Junior Independent Study period last semester. We confirmed today that the rocks are indeed auspicious and will work as the basis of his research. This locality is significant because it records a time and rock boundary in the geological record. The lower portion belongs to the Wenlock Series in the Silurian System, and the upper portion is in the Ludlow Series of the Silurian. They are separated by a disconformity (an erosional horizon indicating a hiatus in the geological time record). Boundaries such as this are always interesting because they can be correlated across the globe with other rocks formed at the same time. We want to better understand what was happening in Baltica at this junction between the Wenlock and Ludlow, and then compare it to the equivalents in Sweden, Britain and North America. 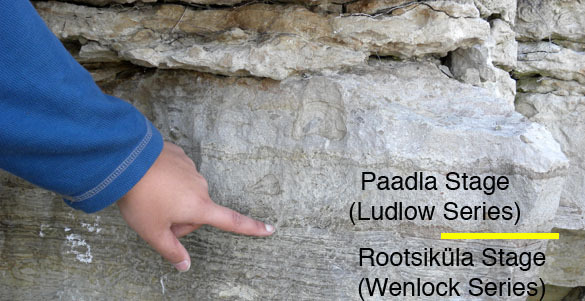 The boundary rocks show a laminated unit in the uppermost Wenlock (Rootsiküla Stage) that has been interpreted as lagoonal in origin, and then a more massive limestone in the lowermost Ludlow (Paadla Stage) with oncoids (microbial accumulations) and eventually shelly beds thought to be more open shallow marine deposits. 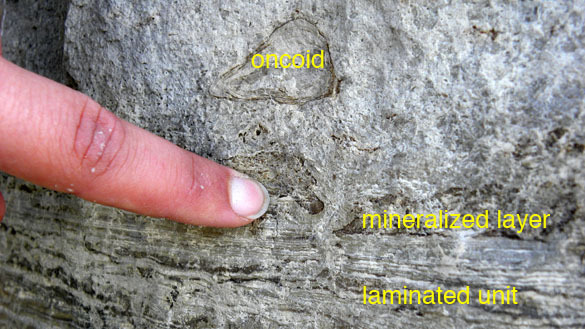 The division between them appears to be marked by a mineralized layer (see image below). Later Nick will collect rock and fossil samples to thoroughly describe this interval and sharpen the paleoenvironmental and paleoecological hypotheses. 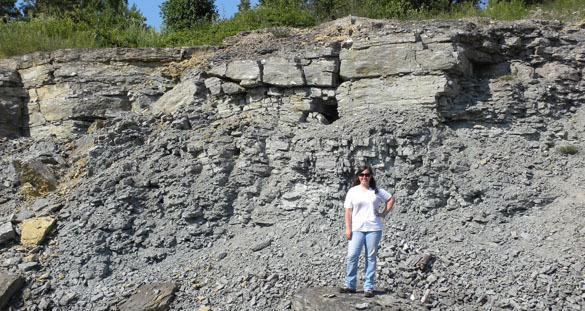 Rachel Matt (below) does not yet know which outcrop will be the focus of her research, but we will soon! Our last visit of the day was to Kaarma Quarry and its exposed laminated lagoonal limestones and dolomites of the Ludlow. You can see below the team in action — and what a beautiful day it was. This week’s fossils are by no means rare — last year Megan Innis and I picked up dozens of them at a muddy outcrop near Starkville, Mississippi, on our Cretaceous-Paleogene boundary expedition (click “Alabama” and “Mississippi” in the tags to the right for entries from that trip). They are, though, significant indicators of a particular kind of ecological system that appeared in the oceans of southeastern North America after the cataclysm of the Cretaceous Extinction. 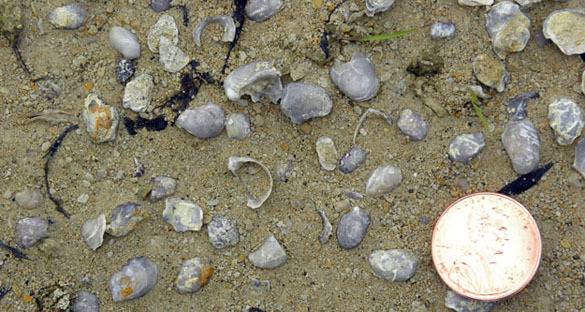 The specimens pictured above are Pycnodonte pulaskiensis, a local species of oyster that belongs to a very prolific genus found around the world. Pycnodonte ranges from the Lower Cretaceous (about 140 million years ago) to, it appears, today. 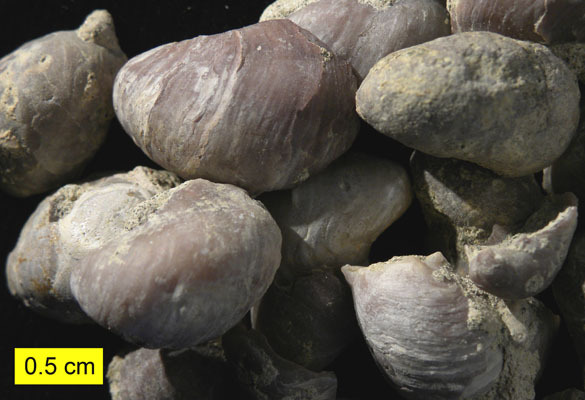 Kase and Hayami (1992) appear to have found this oyster — or a close relative — still living in submarine caves near Japan. This makes them a kind of “living fossil”, a group with a very long history of evolutionary stability. This longevity fits into our Pycnodonte pulaskiensis story. These fossils are very common in the lowest Paleocene sediments just above the extinction horizon that marks the fiery end of the Cretaceous. After all that devastation (and Alabama was uncomfortably close to the impact site of Chicxulub), P. pulaskiensis appeared first to reoccupy the seafloor muds. They were virtually alone in this muddy habitat, and so lived there in great numbers. We call this kind of early successional species an “opportunist” (in the good sense!) taking advantage of a recently emptied niche. Our little oysters in the Clayton Formation near Starkville, Mississippi. 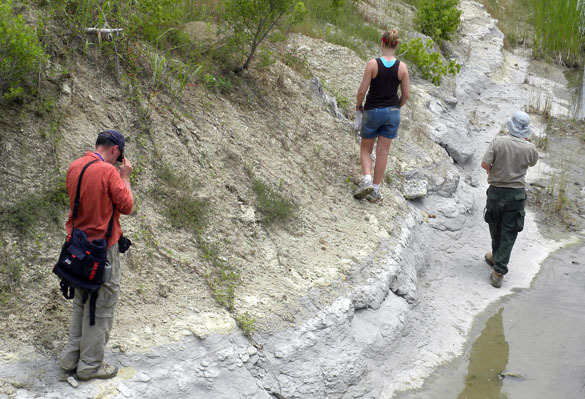 Paul Taylor, Megan Innis and George Phillips at the Cretaceous-Paleogene boundary near Starkville, Mississippi in May 2010. Our oysters were found directly below Megan's feet. These little oysters weren’t entirely alone, though. Many of them have small beveled holes in the center of their left valves, producing the ichnofossil Oichnus. These are apparently the traces of naticid gastropod predators (see Dietl, 2003) that drilled the holes to kill and eat the oyster soft parts. (And who can blame them?) Several shells also have encrusting foraminiferans like Bullopora and Ramulina. Small hints of a recovering ecosystem setting the stage for the modern fauna we see in the northern Gulf of Mexico today. Dietl, G.P., 2003. 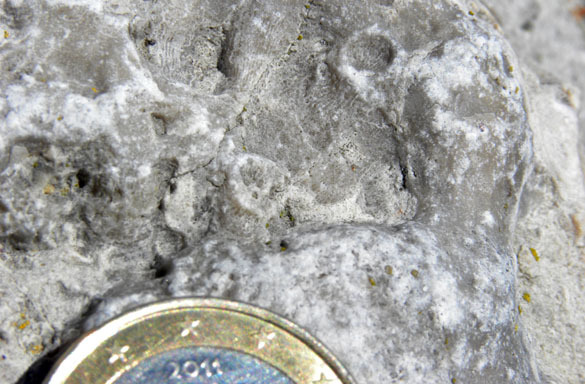 Traces of naticid predation on the gryphaeid oyster Pycnodonte dissimilaris: Epifaunal drilling of prey in the Paleocene. Historical Biology 16: 13-19. Kase, T. and Hayami, I., 1992. Unique submarine cave mollusc fauna: composition, origin and adaptation. Journal of Molluscan Studies 58: 446-449.